I have been debating on chairs and couches for our front room for the past few weeks. I am toying with the idea of slip covering the couches that we have (even though one of the arms is broken) so that I can change out the slipcovers with fun colors that coordinate with each holiday. I got the idea from all the fun colored slip covers Ikea sells for their couches. Red for Christmas, black for Halloween, pink for Easter. 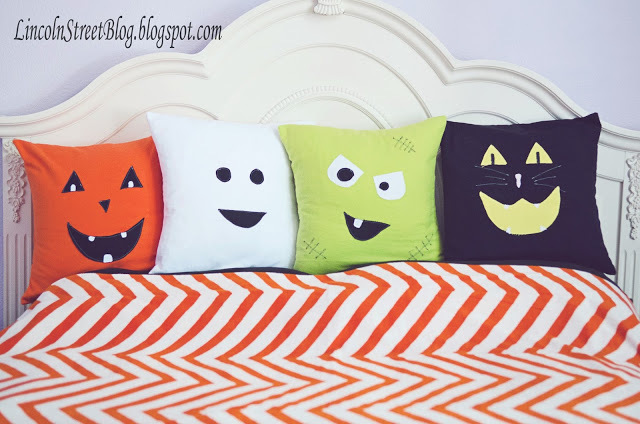 Then I could decorate them with fun pillows like these cute flannel face Halloween throw pillows that Christina from Lincoln Street Blog shared for Spooktakular September. Now if buying all those slip covers didn't cost as much as a new couch, we would be all set! The pillows are still a cute idea either way! You can check out how to make flannel face Halloween pillows over at Eighteen25.